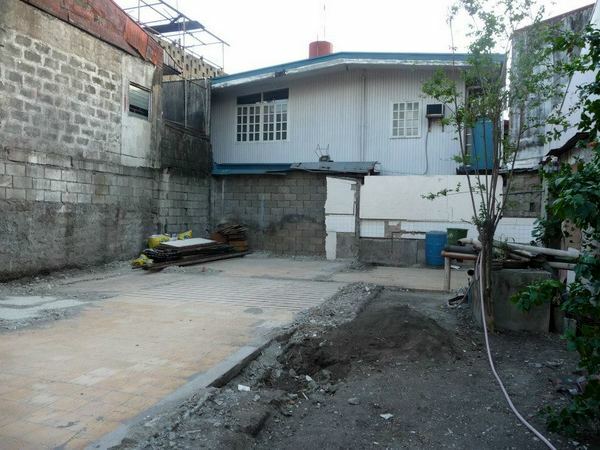 Posted in Cool Guest Authors, FEATURED, Scott H.
First of all, sorry for being such a stranger to all in recent months, but since our move here December 12 2012, we have been pretty busy building our dream retirement home here in Paranaque (suburb of Manila). This could be a long and drawn our story so I guess I'll just start at the beginning. We were very fortunate in that my wife inherited her family home here in Barangay San Dionisio, Paranaque. So we already had property to build on. Once we decided to retire to the Philippines planning began in earnest. While still in the states we started on the basic design of the house. HOT TIP!!! Very early in the process I suggest you make your wants and desires known to your Asawa, say it loudly and succinctly, then never bring them up again because you will only lose the argument. We used the following computer program from floorplanner.com to design our house. It's free, easy to use and you can get pretty exact in your specifications. In fact after a couple of years of toying with it and getting it perfect to our eyes, we gave the website plans to our architect who drew up blue prints almost exactly to our plans. Also while in the states, we had my Brother-in-law start getting the needed permits to build the house. We were told that permits are not really needed. But I strongly suggest them. All it takes is a ticked off neighbor to complain to the Barangay about the noise or dust or something and you would be in a world of hurt. The bureaucracy in the Philippines is no better and no worse than in the States. We are building a 2 story house about a block away from a 9 story building, but still had to get a height clearance from the Airport Authority. Go Figure! Now comes the fun part, BUILDING THE HOUSE. If you happen to have construction experience, have built a house in your home country before or are just Mr. Shade Tree Weekend Warrior Fixer Upper, FORGET EVERY THING YOU KNOW!!! Get rid of any preconceived notion you might have about how things should be done. This will keep your hair pulling down to a minimum. In our case we had to tear down the old house first. This involved just calling several recycle outfits to come and give us a bid. We had several and settled on Mr. Manuel, a serious young man just starting out in business. His bid was the lowest and only P20,000, 465 US Dollars, he would keep and recycle everything that had value and haul the rest away. Simple right? Not so, this is the Philippines remember. On the day demolition was due to start I happened to be standing out front, and noticed several young men get out off a Jeepney dressed in the national uniform, shorts, tee shirt and flip flops. Two of them were armed with shovels, 3 had sledge hammers attached to PVC pipe handles and the rest just smiles. Not a hardhat, steel toed boots, safety goggles or power tool among them. They proceeded to attack the house like a Discovery channel program showing piranha attacking a leg of beef. In one week they had the house torn down recycled and hauled away. How did they haul the debris away? 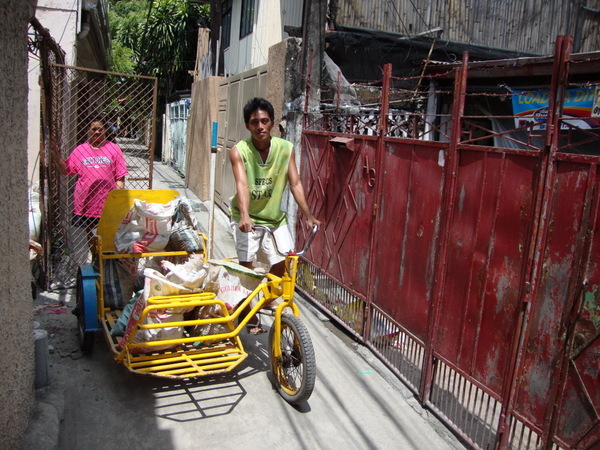 A team of 2 pedicabs, 7-9 rice sacks filled with dirt, old blocks, pieces of wood at a time. Once the site was clear it was time to begin construction. Now there appear to be two methods of constructing a house here. Hire a contractor (which being from the states is what I thought we were doing) or hiring an architect (which is what we did, thank goodness). For an American building a house seems to be simple, you hire a contractor, get the plans and the bid, pay the guy and the house gets built. After he draws up the plans, it is my impression his whole job is that of a "fixer" answering questions, recommending suppliers and stuff like that. He would come by the site once a week to see that all is according to plan or at our request if we had a question or problem. He also recommended one of his "foremen" to us. This is essentially a guy with a full crew of workers who don't actually work for the architect but complete the majority of the projects that he designs. Using the architect method in essence made us the contractor, we handled the crew payroll and ordering all the material (another blessing in disguise). Our architect gave me a list of basic materials, including the recommended brand and quantities that would be needed to build a house of our size and specifications. 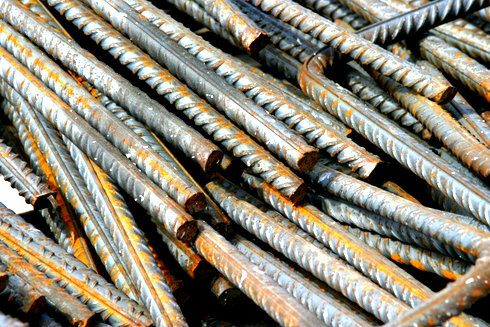 (block, cement, sand, coco lumber, lumber, rebar, etc. etc. etc. This list I took to four local building supply outfits for bidding. All the bids were close to each other, and at one place I had my Brother-in-Law get the estimate to insure I wasn't getting the Kano tax. I choose the one that is nearest to the job site (walking distance) and who's owner spoke excellent English and who would accept checks drawn on a local bank when I ordered materials with out waiting for the check to clear before he delivered the material to the site. The day before construction was to start, the Foreman and his assistant (the Foreman's son) showed up with the architect to look at the site, check the blue prints and make his basic plan, to include the materials he would need to get started. HERE IS ANOTHER SURPRISE! I had to buy most of the tools! As the builder I was expected to provide expendable tools, such as shovels, trowels, pick axes etc. (they had their own hammers) Just giving you a heads up. He also gave us a list of wages for his crew. They ranged from P310 a day, 7.20 US Dollars, for a common laborer to P900 a day, 21 US Dollars, for the foreman. Well we are ready to start building! I hope the process of actually building the house will be more entertaining. Like the blood sacrifice, the crew barracks, the movable toilet all kinds of surprises are still in store. Hope you all didn't fall asleep at the key board. Thanks so much, Scott h! Very helpful information for those that are planning to build a house in the Philippines, something my asawa and I are planning to do next year. 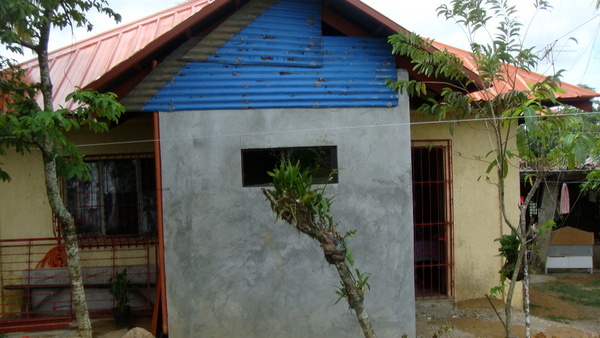 We hired a contractor/architect, Roy, to build a new comfort room, CR, and a new roof for us when we first moved to the Philippines in July 2009. Our contractor/architect (whose wife was, of course, a relative) took care of all the permits, got all the supplies and paid the crew. P170 a day for laborers, 4 USD and P250 a day, 5.80 USD, for the carpenters. I understand those same wages apply today. We're in the Western Visayas region which generally has lower labor costs than Scott's location. I would echo Scott's advice about getting all of your permits. We could have incurred a P1,000 a day penalty if we did not have our paperwork in place. And Scott's right. Get a neighbor mad at you and they will march straight to the barangay captain. You'll wish you had those permits then. You’re exactly right, Gary. One of the first things I did when I moved to the Philippines was have my wife introduce me to our local barangay captain in Guimaras. Very pleasant man. You always want to stay on the Captain’s good side, that’s for sure. It’s not an easy process, Fearless Frank. The amount of red tape involving is staggering. But I’m sure Scott h will be able to pull it off. We just moved here last Wednesday. We live in Kawit, Cavite for now. We will be moving to Iloilo later this year and purchase a house. We are buying one already built. Don’t want the hassles of building one. Good luck with your house and maybe we can get together sometime since we are not too far apart right now. PapaDuck, when do you plan to arrive in Iloilo? We’ll be coming down on August 21st it looks like. As usual I enjoyed your article. 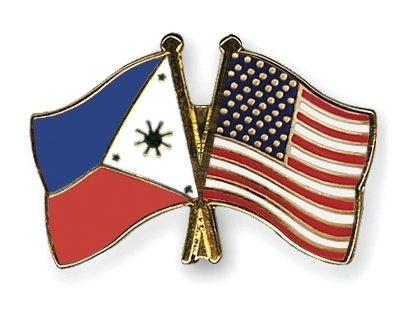 I have been in the Philippines for almost five years now and have been involved in numerous projects. Am I an expert? Nope! I am the first to say that only a fool knows everything. Since I am only 49 and have no pension; I am engaged in business. My wife owned a business in your place for more than ten years before we were married. We have pooled our resources and talents and have some businesses here. The project that I am involved in at present is building a commercial poultry house that is 36′ by 524′. I toured many other farms and modified the design based on what I percieved to be waste of material. According to your article you have indicated that you are the one to purchase the materials. That is my number one rule for any project. One of my suppliers has told me stories of how relatives and contractors routinely ask for kick backs from the material cost. Even in my trucking business I am the one to purchase all of the needed repair parts. This is not a Filipino tradition. This happens in the US too. According to Gary it is not wise to piss off the Kapitan. I will be able to weigh in on that more when my wife becomes Kapitan in October.